Louisiana "The Original" Hot Sauce has been mass produced by Bruce Foods Corporation for over 80 years. As a cayenne pepper based hot sauce, it is similar to other mass produced brands such as Crystal Hot Sauce, Texas Pete and Frank's Red Hot. It is usually packaged in 6 oz. shaker bottles, and sports a yellow, blue and red label. Bruce has marketed the sauce as 'Not too hot, not too mild. Bruce Foods Corporation, founded in New Iberia, Louisiana, in 1928, is one of "America's largest privately owned food manufacturers," manufacturing over 550 food products under nine major labels, and is credited with "pioneering the canning of Mexican food." With four stateside manufacturing plants, the company has more than 1,200 employees. Among its numerous brands, Bruce manufactures Cajun injector marinades, Casa Fiesta Mexican Foods, Louisiana Gold Pepper Sauce, Mexene Chili Products, "The Original" Louisiana Hot Sauce, Cajun King, Bruce's Yams and Bruce's Sweet Potato Pancake, Muffin & Biscuit Mixes. This chicken is tender, juicy and flavorful! Place chicken breast into a plastic container and cover with buttermilk, hot sauce and eggs, beaten. Cover and refrigerate for 12 to 24 hours. Add enough vegetable oil to come just 1/3 inch up the side of a 12 inch cast iron skillet or heavy fry pan. Heat oil to 350 degrees. Drain the chicken in a colander. Season chicken with salt. Combine baking mix, black pepper and cayenne pepper. Dredge chicken in baking mix and shake off excess. Place chicken in the hot oil, cook until brown and crisp, about 10 to 12 minutes per side. Drain chicken on a rack over a sheet pan. Enjoy! That chicken looks excellent! Just curious, who is Debo? You post a lot of their recipes. Debo is my boyfriends nickname. Debo is not your average "foodie", but he loves to experiment & create things in the kitchen. Often we get in the kitchen together. Everyday is a good day for something this good. I can't remember the last time I had fried chicken! Maybe that means it is time to try to make some. =] This recipe sounds great! Christine, this chicken sounds absolutely delicious. What a great recipe! 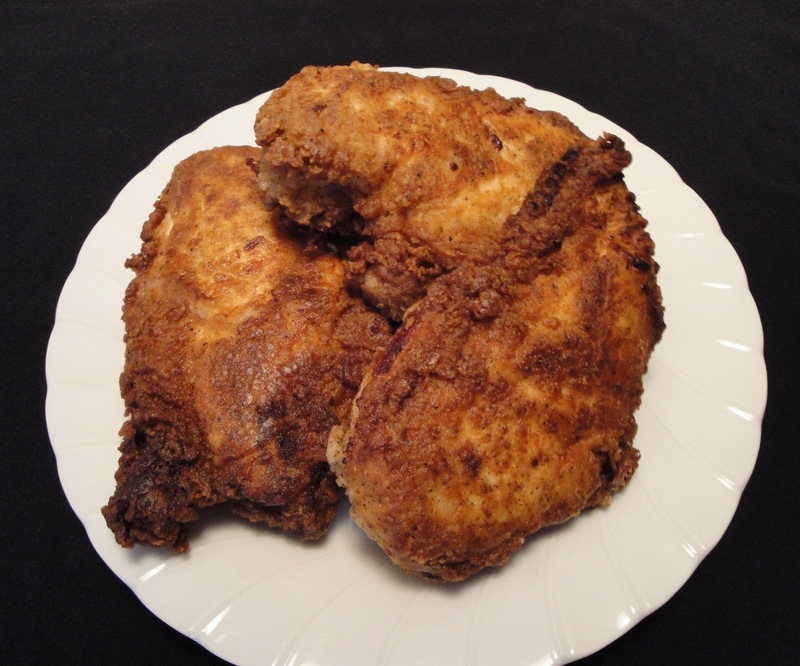 You and Debo are trying to tempt me...I love fried chicken but don't eat it very often. This looks delish!